A great place to learn or improve your CW no matter if you are a beginner starting to learn Morse for the first time with no knowledge of it at all, or an experienced high speed operator, is LCWO.net. Use the "Morse Machine", set your character speed to NO LESS than 18WPM, even 20WPM, and listen to the SOUND of the first character. When you are ready for the next character you can move on. You have all the time in the world to decide which character you heard, if incorrect it will light up red. To hear it again before you make up your mind, when in the Morse Machine, press the space bar. When you are more confident you may like to move on the the Morse lessons starting at number 1. However, I recommend total beginners start with the Morse Machine first, as above described. To increase your sending speed, there is one other thing you could do and that is to try a short burst at a higher speed to get the feel of it, then back down to a slower speed, then up to your normal speed again. Over time, you will find that your overall speed will increase as you get more and more used to it. This also works for receiving. Try to copy morse at a higher speed for a short session and don't worry about the errors. Over time the errors will get less and less, but always strive for accuracy over speed. If you miss a letter, just go straight to the next one without dwelling on it because if you do dwell on it, then you miss the next letter!! There is a nice little free program we use at the Caboolture Radio Club where I am running morse training classes. http://www.justlearnmorsecode.com/ It runs very well on my old laptop. It can be configured for 5 letter groups, figures, mixed, plain text and it uses both the Farnsworth and Koch methods. So the character speed can be say 20 wpm but the overall speed can be 7 or 8 wpm. Slowly you increase the overall speed until it matches the character speed. When you are ready for your first live QSO, if you don't have someone mentoring you, see "CW Calling Frequency" above, and QSY to around 7028kHz, or call CQ down there. Be patient, you will get results. For Elmering with SSB talk-back, 7115LSB/7114CW is recommended. Don't try to send too fast, send slowly and relaxed is much better. You can still exchange RST, name, QTH and 73 in a slow QSO until you are ready to have longer ones where you can mention your PWR, ANT, WX etc. Every CW Operator should print out and keep handy a list of Q-Codes. Do not use lots of "." 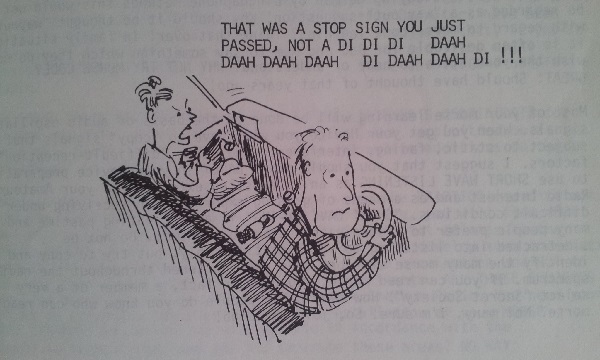 (di-dah-di-dah-di-dah) — use instead "=" (dah-di-di-di-dah) it's much shorter. If you are in QSO, end each over with KN so that no one else breaks in and confused you. KN means "only that station" answer. Do not use a keyboard to send CW, unless at high speed to an experienced operator. Nothing is more frustrating to a CW operator than hearing slow CW with words spelled out in full, such as AND instead of ES, and "…" instead of a short "="
Do NOT EVER say "Hi" as a greeting on CW!!! Hi means you are laughing! If you start your QSO with "Hi" the other OP will wonder why you are laughing! instead use GM, GA, GE or GN depending on the time of day. Do give honest reports, learn the RST system or have it printed out and in front of you. We like to know what the REAL readability and signal strength of our signals is. When the other station puts it back to you do NOT spend time reading through what you've written down before answering him, as he will wonder if you have gone away… if you need to read your notes, FIRST SEND "AS" (standby) twice, THEN read your notes, then come back with his callsign DE your call sign and your transmission. If you want someone to wait, send "AS"! Do NOT panic, if you feel nervous, just send "AS AS" and take a deep breath, shake your hand loose, and don't grip the key too tight. Most of us are VERY happy to hear a new operator on CW and pleased to be one of your first QSOs! Do NOT spell out HOW DO YOU COPY? instead just use: HW? Do not be shy to send QRS or [AS] when needing time before replying, or needing the other station to slow down. Do not be afraid to ask for repeats of information you did not receive correctly from the other station. E.g. Name? RST? If you avoid the above common mistakes made by newbies these days, you will be well on your way and avoid confusion and/or frustration. Please see the QRS page for more information about starting out and going on air. Please see the Skeds page for latest information on CW Practice sessions and nets. Also don't forget the VK2WI CW Beacon that sends practice text on 3699kHz almost non-stop. Read more about Learning CW here. Please leave your feedback and results in the Comments below!